Dimethyl carbonate (DMC) is an important organic chemical intermediates, it widely used in carbonylation, methylation, methoxylation and carbonyl methylation and other organic synthesis reaction. Because DMC is non-toxic, it can replace the highly toxic phosgene, methyl chloroformate, dimethyl sulfate as a methylating agent or carbonylation agent used to improve the safety of production operations and reduce environmental pollution. As a solvent, DMC can replace freon, trichloroethane, trichlorethylene, benzene, xylene and so on for paint coatings, cleaning solvents. As a gasoline additive, DMC can improve its octane number and oxygen content, thereby enhancing its antiknock. 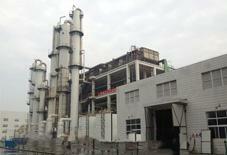 In addition, DMC can be used as detergent, surfactant and softener additives. In the process of oxidizing carbonylation of methanol to dimethyl carbonate, the reaction solution contains a large amount of unreacted raw materials and by-products (such as formaldehyde, trioxaldehyde and the like) in addition to DMC, and further separation is required to obtain DMC products. As the raw materials containing formaldehyde, trioxaldehyde and other impurities, these impurities on the follow-up distillation process and equipment selection has a significant impact, so the need for pre-treatment device for pre-removal, removal of formaldehyde, trimethyl formaldehyde after the material into the follow-up Of the distillation system. Removal of formaldehyde and paraformaldehyde materials due to methanol and DMC forming azeotrope, ordinary distillation can not get a pure product, therefore, it usually using two-step separation combined：The first step is the initial distillation stage, the use of azeotropic distillation way, in the packed column to obtain methanol-DMC azeotrope, and other products separated；In the second step, the DMC was obtained by the effective separation method. 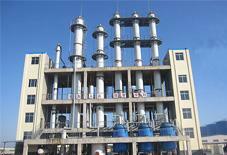 The main methods were low temperature crystallization, extraction distillation, azeotropic distillation and pressurized distillation. The purity was higher than 99.9 % High purity DMC products. 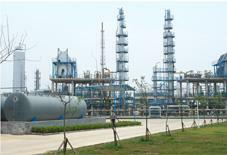 To a company 30,000 tons / year crude dimethyl carbonate (DMC) refined, for example.